Regular children's sleep affects a child's brain development. Is your child's sleep hours enough? Read the following review. Maybe we have often heard that children need 12 hours to sleep so they can grow healthy. But did we know that the daily routine of sleeping a child affects the development of the child's brain? Research conducted by several British scientists concluded that children who are accustomed to regular hours of sleep have higher cognitive abilities than children who sleep irregularly. As written in the Huffington Post, more than 11,000 children aged 3.5 and 7 years were tested for reading, math, and also spatial abilities. From this test, the influence of the bedtime routine on a child's brain development can be proven. At present, there is no research to prove which is more influential on a child's brain development: the number of hours of sleep or the consistency of sleep hours because both are interrelated. 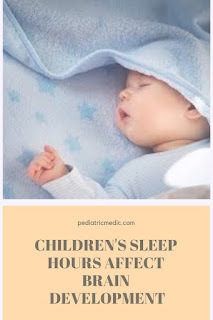 But the researchers revealed that the irregularity of children's sleep hours also affects the child's overall development because generally, irregular sleep hours indicate irregularities in the family. Children who sleep late at night tend to watch TV longer at night, where nighttime shows are not suitable for children. Or, the child plays a computer or games late at night so he forgets time and skips breakfast the next morning when he wakes up in the afternoon. Children who sleep irregularly are also most likely rarely read stories or stories every night. According to the National Sleep Foundation recommendations, for children aged 1-3 years, the number of hours of sleep needed is 12-14 hours per day. Whereas for children aged 3-5 years need 11-12 hours per day. If the child is older at 5-12 years, they need 10-11 hours per day. So make sure your child is getting enough sleep every day, 7 days a week, with regular hours. What should we do to meet those needs? Make a consistent sleep routine every day. For example, starting with washing your feet, brushing your teeth, changing clothes with pajamas, then reading stories and turning off the lights. Drastic changes will not work. If your child is sleeping late at this time, do the bedtime routine 15 minutes earlier than the day before, until it reaches the desired time. Good luck parents! Hopefully, the information about the influence of children's sleep hours on brain development is beneficial.